It seems the long held social custom of Shanghainese to walk down the street in their pajamas is causing some discomfort to the organizers of the Shanghai World Expo scheduled for next year and a campaign has been started by the municipal government to end the practice. “So, it’s not really about whether we like it, but rather about whether we are liked. Again, it’s the quintessential concept of “face” and “saving face”. 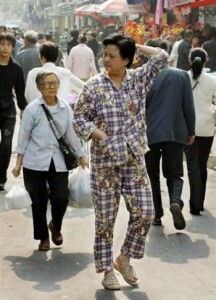 The city’s tactic to stamp out street pajama wearers was to create a team of 500 volunteers to use persuasion at bus stops and other venues to convince pajama wearing Shanghainese residents to change their clothes. minipost-India: Friend, Enemy, or Both? This article was printed in the People’s Daily on June 19th. Since this is a state controlled publication, whatever is published will usually have the blessing of the CCP leadership. Chinese President Hu Jintao and India PM Manmohan Singh recently appeared together at the BRIC summit in Russia. Things seemed friendly enough at the time. What has changed since then? And why would China have a problem with the Asia Development Bank financing development projects in Arunachal Pradesh? I would think economic development in an area that China considers to be a part of her territory would be viewed by China in a positive manner, as it would be beneficial to the people of that region. Is Chinese Meritocracy a Viable Alternative to Western Democracy? And even within China, between different provinces and peoples are tremendous psychological differences, perhaps even greater than those between two countries. As time has passed, as the people’s living standards have grown and as awareness of personal rights has woken… if the traditional methods of political pressure and thought control are used, it’s already become very difficult to maintain the China unity and a sense of belong to the Chinese people. The government has observed this point, but unless it implements effective political reform that respects and tolerates the interests of different groups of people, it will not resolve this fundamental problem simply by waving the worn-down flags of patriotism and nationalism. I don’t think we disagree on this point, but I think Youzi goes a bit far to berate some of us for suggesting that an “awareness of personal rights” alone and a shallow understanding of “fighting for personal rights” without civic values and respect for law is a recipe for disaster. It’s a two way street. What makes “Western-style democracy” tick isn’t the prescription of “freedom, democracy, and rule of law”, but the deeply ingrained sense in every single citizen that their interests lie in their responsibility to and stewardship of the country, its institutions, and values, of which such rights are a part — in short, true patriotism. That prevents people from ripping the constitution apart when they don’t get their way. Sad to say, China isn’t there yet. Long Time Coming – The Prospects of Democracy in China. I posted it weeks ago in a comment but it really deserves its own highlight here.